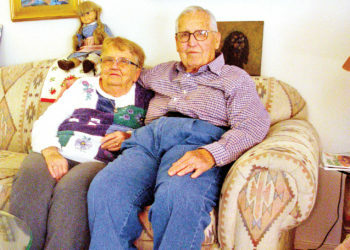 Carol and Virgil Baker celebrated their 65th wedding anniversary December 27, an earmark worthy of congratulation. Both were raised on farms in Nebraska, Virgil’s home being 100 years old. It was the time of the Great Depression which led into WW II where Carol’s father served in the Sea-bees. Times were not easy. “Virgil,” recalls Carol, “sat behind me in a college English class. I became interested in him because we had so many things in common.” Three years later brought marriage and then three sons, seven grandchildren and five great-grandchildren. Virgil’s ambition was to become a teacher also. He received his BA from Wayne State College the University of Wyoming for the MA and graduated from three colleges. Involved in high school sports, he continued football in two of the colleges. During his education career, he was also principal for 28 years. 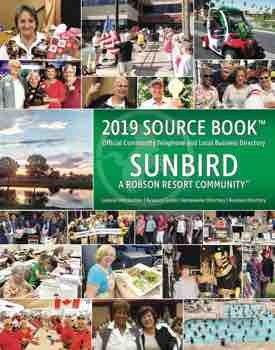 Arriving as residents to SunBird in 1995, the two had learned about our complex while visiting Virgil’s parents. They return to Wyoming in the spring for half the year. From 1949 to 1957, Virgil served in the Navy, both active and reserves. He also flew for the Civil Air Patrol 1943 to 1984. He vividly recalls terrible blizzards in 1949 when he flew over the vast plains areas as a pilot for Civil Air Patrol. Surveillance was impossible. Another situation makes this couple even more unique. For many years, they have been part of the firefighters in their area, where at least five houses were lost. They remembered one fire where Carol and Virgil prepared food for over 50 firefighters. Indeed, this couple is active, achievers and quite unique. Incidentally, these ex-teachers are very nice people.